The hopes of Farmers for better times after the Great War were not met. Prices soon slumped. A horse would make only £50 ; cow values halved to £ 25, with milk price dropping to a fifth at 6d a gallon. Workers wages slumped to 25 shillings a week. On our hilly soils, very mixed farming relied on hard labour from both man and horse. All relied much from 'living off the land '. Rabbits were abundant, as were mushrooms, pigeons , nuts and blackberries . With the threat of another war, prices gradually improved, but by 1939 many young rural men joined the Territorial Army as a means of earning a bit of pocket money. In May, Taunton's West Somerset Yeomanry - field artillery having shed its horses for gun tractors - accepted the author of this piece, a young Winsham farmer, to finally fill its battery quota . 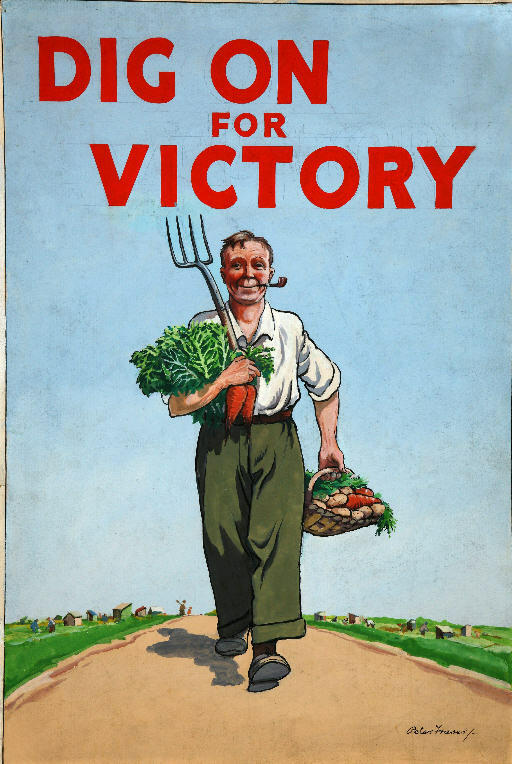 With the advent of the second World War, and the pressures placed on convoys by the German submarine fleet, the Government soon realised how much we would rely on home grown food. In peace time large acreages were devoted to parks and other uses. Permanent pasture was inefficient, as was the grazing animal that lived on it. Land which had not been built on was made produce 'primary' food. So the County War Agricultural Executive Committee was set up to work through the District Committees, each covering some seven parishes. There were Ordinance Survey maps with every field numbered. Their task was to ensure that every possible field be ploughed and set to grow Wheat, Oats , Barley , Potatoes or Sugar Beet. Only steep, wet or tiny past ures could be reserved for dairy cows. Pigs, poultry and sheep were to be discouraged. Both purchased animal food concentrates and fertilisers - especially potash - were to be strictly rationed. The extra arable machinery was supplied for hire at depots. One was at the Windwhistle Inn (landlord Mr Kidd). Ministry tractors - the Standard Fordson(petrol model), or a small Caterpillar Crawler( with drivers) did the ploughing and most cultivations. There were reports that ancient Titans and Mogul tractors were available. The self-binder did the harvesting of the grain. Additional labour was supplied by the Woman's Land Army, 'live-in' Italian POW's - or later - German POW's, arriving in truck loads for the day. Certain farming men ,serving in the armed services, could apply for up to one month's 'Agricultural Leave' per year if their Units could spare them. Threshing was done in the winter by Steam Traction Engines with the large mobile Threshing Machines. All this sudden change of local practice meant that arable outputs decreased per acre. It became inevitable that crops were often sown late, or in poor weather. Harvesting was difficult. Farming on a war footing was declared a 'reserved occupation'. Despite every sort of problem, this drastic action was made to work. If it had not, the nation would have starved. Although the War ended in 1945, Food rationing lasted until the mid-fifties.